In 2012 a gathering of scientists and scholars met to discuss the meaning and possibilities of the site in the First Floridian First American Conference in Monticello, Florida. Pre-Clovis artifacts were displayed and studied increasing lay and scholarly interest in the Red Hills Region. Louisiana (Spanish: Luisiana) was the name of an administrative district of the Viceroyalty of New Spain from 1762 to 1802 that consisted of territory west of the Mississippi River basin, plus New Orleans. Spain acquired the territory from France, who had named it La Louisiane in honor of King Louis XIV in 1682. It is sometimes known as Spanish Louisiana. The district was retroceded to France, under the terms of the Third Treaty of San Ildefonso (1800) and the Treaty of Aranjuez (1801). In 1802, King Charles IV of Spain published a royal bill on 15 October, effecting the transfer and outlining the conditions. However, Spain agreed to continue administering the colony until French officials arrived and formalized the transfer (1803). The ceremony was conducted at the Cabildo in New Orleans on 30 November 1803, just three weeks before the formalities of cession from France to the United States pursuant to the Louisiana Purchase. ​a local institute to support scholarly study of the Aucilla Basin. Florida, Georgia, or the southeastern United States. It was only in the twentieth century that a deepening interest in early missions resulted in several new research efforts and the knowledge we have to date. Thanks to Dr. John H. Hann of Tallahassee, a research historian and leading scholar on the missions of Spanish Florida, we now have the most-up-to date findings and writings. 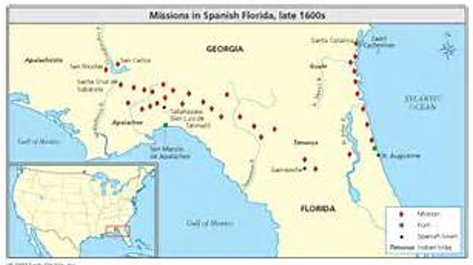 Documentation exists of at least 124 missions during the first Spanish occupation (1565-1763) of the southeastern United States. These missionary efforts can be divided into five distinct periods. A pre-mission settlement period followed by a first, second, third, and forth mission period. provide the same rich resources available as other Spanish held territories. successful, had a total of 13 missions established, with only three still in use in 1587. Click play to watch and enlarge to full screen. "A Social Network Approach to Exploring Identity at Mission Santa Catalina de Guale"
Elliot Blair is an Assistant Professor at the University of Alabama. He received his doctorate from the University of California, Berkeley in 2015. His research sits at the intersection of empirical, archaeometric analyses and a social archaeology of materiality and identity, focusing on questions of population aggregation in the colonial Southeast. "The Changing Role of Missionaries and Missions in Spanish Florida, 1513-1763"
​Click play to watch and enlarge to full screen. "Spanish Missions' legacies and New Perspectives"
​Mariah D. Wade Ph.D., is an Associate Professor at the University of Texas at Austin, Department of Anthro-pology. She studies Archaeology and ethnohistory of North America, colonial and post-colonial American Southwest, Iberian Bronze and Iron Ages and Roman Period; Portugal, and North America. ​"Spanish Missions' legacies and New Perspectives"
"Community Structure and Organization at Mission San Josephde Sapala, Sapelo Island, Georgia"
Richard W. Jefferies is a professor and Director of Undergraduate Studies in the Department of Anthropology at the University of Kentucky. His research interest include Prehistoric hunter-gatherer societies of the Southeastern and Midwestern United States; mortuary/ritual behavior in intermediate level societies, Mississippian settlement and subsistence systems; lithic analysis; cultural ecology; prehistoric economic and interaction systems and Spanish Mission period in the Southeastern United States. ​"Community Structure and Organization at Mission San Josephde Sapala, Sapelo Island, Georgia"
"The Maritime Timucua: Mocama Missions by the Sea"
​Keith Ashley is Assistant Professor of Anthropology at the University of North Florida. He holds a PhD in Anthropology from the University of Florida. His current research focuses on the history and cultures of Native Americans in Florida before and after European arrival. ​Robert Thunen is an Associate Professor of Anthropology and Chair of the Department of Sociology, Anthropology, and Social Work at the University of North Florida in Jacksonville. His research interests include the Woodland and Mississippian Periods in the Southeastern U.S. and the early historic period in northeast Florida. ​"The Maritime Timucua: Mocama Missions by the Sea"
"Timucua language and social hierarchy: Evidence from Christian miracle stories"
​George Aaron Broadwell is the Elling Eide Professor of Anthropology at University of Florida. He received his B.A. from Harvard (1983) and his Ph.D. from UCLA (1990). He is a linguistic anthropologist with research interests in the indigenous languages of the Southeastern United States and Mexico. ​"Timucua language and social hierarchy: Evidence from Christian miracle stories"
"Responses to Missionization: The Historical and Archaeological Evidence from Two Mission Sites in Northern Central Florida"
Willet A. Boyer, III, received his master's and Ph.D in anthropology from the University of Florida, with a focus on the archaeology of the late pre-contact, early contact, and mission eras in Florida and the Southeast. He has worked at multiple early contact and mission sites throughout Florida. He is a seventh-generation native of Marion County in northern central Florida and currently holds the position of Associate Scholar with the Aucilla Research Institute, Inc.
"Excavations at the presumptive site of Mission Santa Cruz de Cachipile"
a a large, contact period Native American village. "An Analysis of Artifacts and Archaeology at 8E106, a Spanish Mission Site in Florida"
​Alissa Siade-Lotane is the Chief of the Bureau of Historic Preservation at the Florida Department of State and a Deputy State Historic Preservation Officer for the State of Florida. She holds an M.A. in Anthropology and a Museum Studies Certification from Florida State University, and a B.S. in History from Troy University. From Farm to Table: "Investigating Apalachee Foodways in the Mission Period"
​Dr. Tanya M. Peres is an Associate Professor of Anthropology at Florida State University. Dr. Peres earned a PhD in Anthropology from the University of Florida (2001) and an MA (1997) and BA (1995) from the Florida State University, both in Anthropology. She is a Registered Professional Archaeologist since 2001 and has nearly two decades of field and lab experience on academic and applied prehistoric and historic archaeological projects across the Southeastern United States, Panama, Mexico, and Scotland. Dr. Peres's research interests include the relationships between humans and their environments, humans and animals, foodways, and the incorporation of animals into native worldviews. She currently directs the FSU Apalachee-Spanish Mission Archaeology Project, the FSU Maritime Woodland along the Florida Gulf Coast Project, and the Middle Cumberland Archaeology Project. As a zooarchaeologist Dr. Peres collaborates with local, state, and federal agencies as well as CRM firms. She has researched and published on zooarchaeological topics ranging from ancient and historic subsistence practices to the use of animal bone and teeth implements in indigenous tattooing traditions to the symbolic power of animals in native cosmologies, medicine, and spiritual practices. ​ Mary Glowacki is a State Archaeologist and Chief, Bureau of Archaeological Research. Florida Division of Historical Resources. Mary Glowacki has served as supervisor for its Public Lands Archaeology program. a number of grant-funded archaeological projects in Peru. "An Overview of Past Excavations, Interpretations and Current Questions at 8LE120, Mission San Damian de Escambe"
in Mission archaeology. Since then, he has continued to delve deeper into the history and archaeology of the Spanish periods in Florida. Nicholas' research interests include Spanish ironworking, weapon and tool diffusion in colonial contexts, and mission land use. He seeks to bring the previous research done at lesser known sites on state lands, such as Mission San Damian, to light and to carry out and promote further research on them. 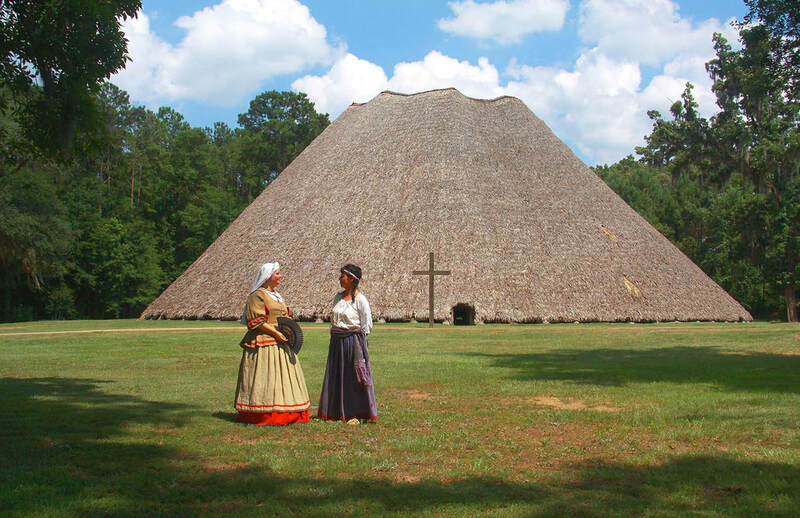 "Mission San Luis de Apalachee"
volved with Spanish mission archaeology throughout his career. He received his undergraduate degree in Anthropology from FSU, attending Dr. Rochelle Marrinan's field school at the Apalachee mission of Patale. 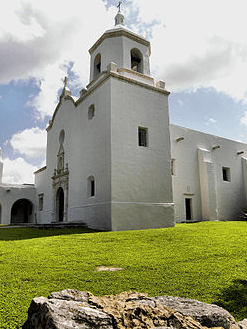 He joined the Florida Department of State's research at Mission San Luis not long after, in 1989. Mr. Lee feels fortunate to have been able to be a part of San Luis for so long. He is also gratified to see the research from San Luis translated into faithful reproductions of many of the buildings that once existed here for the education and enjoyment of the public. "The Tocobaga and the Wacissa Canal - Lifeline of the Spanish Missions in Jefferson County, Florida"
George Cole, Ph.D, PE, PLS, is a professional engineer, surveyor and physical geographer. He is an adjunct professor at Florida State University. He has served as Chairman of the Jefferson County (Florida) Planning Commission and on the Governing Board of the Suwannee River Water Management District. Cole holds a bachelor of science degree from Tulane as well as master of science and doctor of philosophy degrees from FSU. He is the author of numerous technical papers as well as several books including Water Boundaries (John Wiley & Sons, 1997) and Surveyor Reference Manual (Professional Publication, 2010). He has also written chapters in Brown's Boundary Control and Legal Principles (John Wiley & Sons, 2014) and Brown's Evidence and Procedures for Boundary Location (John Wiley & Sons, 2002). ​"The Tocobaga and the Wacissa Canal - List of the Spanish Missions in Jefferson County, Florida"
"The Lives of Friars in Apalachee Province"
Rochelle A. Marrinan has been a member of the faculty of the Department of Anthropology since 1982. From 1984 to 2002, she directed the department's annual spring field schools for undergraduate and graduate students at Mission Patale, the O'Connell Mission site, and the Castro site - all seventeenth-century archaeologicallocations with Missicn-period cultural materials. She is a Registered Professional Archaeologist and currently serves as department chair. ​"The Lives of Friars in Apalachee Province"
Gilmer "TJ" Bennett a Councilman of the Apalachee lives in Pineville, Louisiana where the only documented survivors of the Apalachee that were once numerous in the Red Hills area of Florida now live. In 1763, about 80 of the Apalahee Indians living in Mobile, Alabama relocated to the area on the Red River between Natchitoches and Alexandria, Louisiana in Rapides Parish. Today, many of the descendants still remain in the area and have applied for federal recognition using the Rapides Parish records. Gilmer "TJ" Bennett discusses the history and background of the Apalachee as they moved from Mobile, Alabama to the area on the Red River between Natchitoches and Alexandria, Louisiana.